Al Shams was beginning to think the farmhouse wasn’t meant to be. In 2013, he and his wife Debra moved to Woodbury from Mississippi, and shortly after, he spotted the property—originally built by the Stabenow family—with a “for sale” sign out front. But when Shams inquired, he found out the house had just sold. “I was two or three weeks late,” he remembers. “So I bought another house, and we moved in.” He kept his eye on the Stabenow farmhouse, and, as serendipity would have it, it came back on the market in the fall of 2017. By that point, Shams was deeply interested in the house. “I built houses,” he says. “I had a business doing that,” and could picture the things he’d update, change and restore on the Stabenow house. In fact, he had a history with another old home. “I remodeled a 1910 model in Mississippi,” Shams explains, “and I told myself, ‘Never again!’” The headaches of working on a more-than-100-year-old structure were enough to make him throw in the towel—almost. The farmhouse had been sold to a couple of interim owners between the Stabenow family and the Shams family, but no one had lived in the home for at least five to ten years, Shams says. What they uncovered during the gutting process was tough. “There were dead bats in the house,” to begin with, he says. And not just, ahem, the dead ones. “When we started taking things out of the house last summer, about 300 bats came out of the house. It was like Batman’s cave. They still come around, but they can’t get in now,” he adds. He even built them a bat house to try to entice them away from the farmhouse. “But they don’t seem to like it,” he adds with a laugh. The leaking roof had caused lots of plaster to break down. There was wallpaper and carpet in bad shape; the kitchen cabinets were destroyed. So Shams got to work. He designed the new layout himself and did lots of the framing. Not only had the house been remodeled several times by previous owners—with additions to the main floor—but the floor plan didn’t lend itself to 2019 standards, either aesthetically or practically. “I drew the design 14 or 15 times,” says Shams. “It had been a very strange layout, and was hard to fit everything in with [modern building standards]. The size of bathrooms nowadays is different, and the way you run plumbing is different—although the house didn’t have much plumbing to begin with.” Shams and his team also installed central, forced-air air conditioning, a huge challenge. But one thing Shams was especially excited about was the property’s large shed. “It has a six-garage-door shed, which, in the middle of Woodbury, is a commodity,” he says with a smile. “I’ve got two antique cars that I’m going to bring in and work on. You have to have a big room to do that.” Also on the plus side, the home’s foundation was solid and level, which meant all the renovation needed to happen from the ground up. “We did have to put some concrete in the foundation, because it was limestone, to seal it from rodents and creatures.” Shams says he’ll also be able to hook up the home to city water. 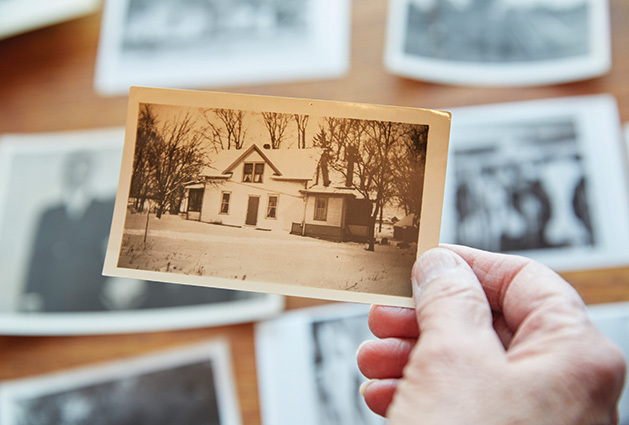 Marilyn Stabenow-Chinnock has great memories of the Stabenow farmhouse. After all, she spent many hours there each week when she was a little girl. Her great-grandparents, Christian and Elizabeth Stabenow, built the home in 1880. “They were farmers. They had crops and animals,” Stabenow-Chinnock says. 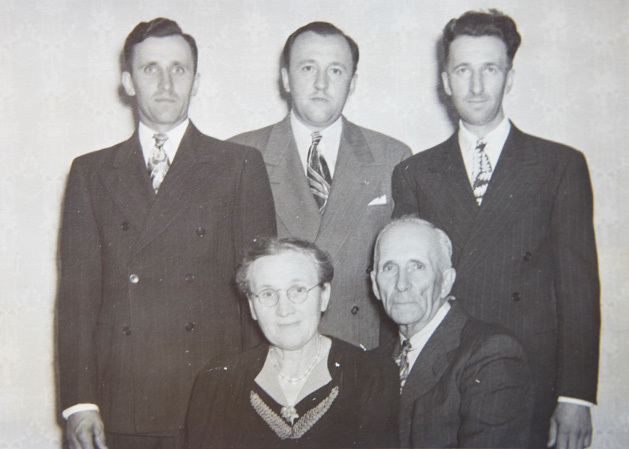 “My grandfather Fred was born in the new house in 1880.” Fred was the youngest of three Stabenow children, and he farmed there with his own adult children for many more decades. “Of course, my grandparents and great-grandparents did most things with horses, until about the 1930s,” Stabenow-Chinnock says. Her father Arnold was also born at the farm, and as a kid, Chinnock and her siblings and cousins spent a lot of time there. “I helped during threshing time, milking the cows in the barn, and that kind of thing.” Her uncles Gilbert and Irvin lived on the farm, too. As was common for farming families at the time, multiple generations of the family usually lived in the house together. “There’s a portion of the house that was the original house, and then when my uncle got married, they added on, so there were actually two houses,” says Stabenow-Chinnock. “My grandparents, Fred and Martha, lived in the smaller second addition. My uncle and his wife lived in the original house. My cousin was born there, too. 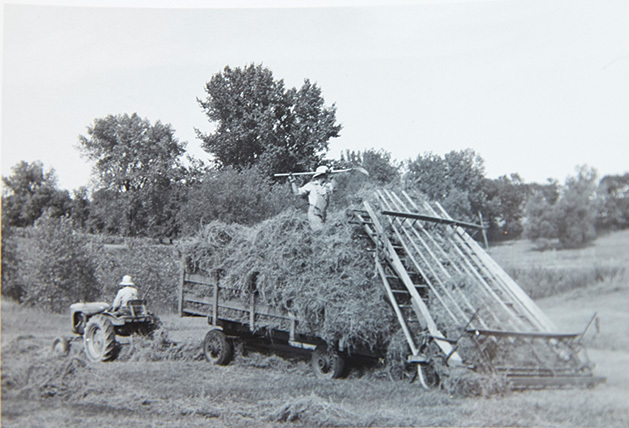 The Stabenow family farmed the land for several generations. Thanks to Al Shams, the farmhouse will once again be lived in. One of his favorite parts of the renovation, he says, is simply meeting the challenge. “It’s making something that everybody says, ‘It cannot be done.’ When you see it all happen, and everything fits, it’s very rewarding to look at it. It’s very rewarding to say, ‘I did this, and I’m going to live in it.’” Thanks to Shams, the farmhouse lives to see another family inside its walls, and thanks to Marilyn Stabenow-Chinnock, its history is alive and well, telling the story of the Stabenows and so many other Woodbury families whose early farms are now distant memories.